The sights and sounds associated with Halloween can sometimes be overwhelming for seniors with dementia. However, this doesn’t mean your aging loved one can’t enjoy the season. You can engage your parent in the following Halloween activities without upsetting his or her daily routine. The scent of a delicious pumpkin pie wafting through the house provides a sensory experience that may bring back memories of past fall seasons. Your loved one may also enjoy helping you perform tasks such as mixing the ingredients. To make the activity safe for a parent with dementia, make sure to handle the baking portion of the recipe. Encourage your parent to relax with a cup of tea while you make sure the oven gets turned off. Older adults who need help managing basic tasks should consider professional in-home care. Victoria elder care experts are available to provide high-quality care to seniors on an as-needed basis. From assistance with mobility and exercise to providing transportation to the doctor’s office and social events, there are a variety of ways professional caregivers can help your aging loved one continue to live independently. If your loved one is frightened by Halloween decorations, getting out of the house may be a challenge since even grocery stores are decorated with spooky items. For an alternative outing, take your loved one on a drive to see the gorgeous fall foliage. While looking at the leaves changing colors, your parent may enjoy a sense of peace. Having trick-or-treaters ringing the doorbell can be overwhelming for seniors with dementia. However, your loved one may still want to do something nice for the neighborhood children, and putting together treat bags provides a sense of purpose. To prevent your parent from indulging in too much candy, choose small toys and trinkets to fill the bags. Then, place the bags in a large bowl on the porch to minimize people ringing the doorbell. Putting together treat bags is just one of the many ways older adults can enjoy a sense of purpose. Seniors who want to remain healthy as they age can benefit in a variety of ways when they receive professional senior care. Victoria, BC, Home Care Assistance is here to help your loved one accomplish daily tasks, prevent illness, and focus on living a healthier and more fulfilling life. Halloween decorations don’t have to be scary, and your loved one may need an alternative to carving pumpkins for safety reasons. Grab a few decorative gourds and set your loved one up with some craft supplies. 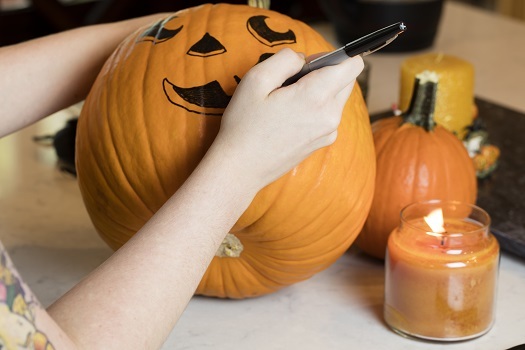 Googly eyes, glue, craft paper, and paint are a few supplies your loved one can use to decorate the gourd. The activity lets your parent express him or herself in a safe way. Help your parent make an accessory that allows him or her to dress up. For instance, your loved one may enjoy making a crown or tiara, or he or she may prefer to decorate a shirt. Then, your parent can use the accessory to dress up for Halloween events without feeling as though he or she is unrecognizable to others. Dementia can be challenging for seniors to manage, but they can maintain a higher quality of life with the help of professional dementia care. Victoria seniors can benefit greatly from the Cognitive Therapeutics Method (CTM), an activities-based program designed to promote cognitive health and delay the onset of dementia. CTM is included at no additional charge with any of the in-home care plans provided by Home Care Assistance. To schedule a free in-home consultation, give us a call at (250) 592-4881 today.